It’s almost the end of the year, Christmas is just around the corner and whilst many companies may be concentrating their efforts on preparing their marketing for the festive season, it’s the perfect time to start thinking about online strategies for the upcoming year. Bearing this in mind, and taking a look at some of the studies which have been doing the rounds, we thought we’d give you some food for thought as to the best ways of going about your marketing next year. It’s no secret that online and social media marketing works, but it’s also not thought to be the easiest thing to carry out. There still remains debate about the best practices when it comes to the use of social and many businesses and social media agencies alike, are still getting it wrong, especially those with no content marketing knowledge who just make it up as they go along. This can be a costly mistake in a variety of ways, customers are driven to the competition and social media campaigns can fall flat on their face as they’re badly managed. A recent study from InSites Consulting in collaboration with SSI, a data partner, and translation agency No Problem! looked at consumer behavior in order to better understand what makes them tick. Pinterest has more value than Instagram. The study found that whilst 3% of companies use Pinterest, 4% use Instagram – however, 50% of Pinterest users login daily to the site compared to 31% of Instagram users. In addition to this, 60% of pinners say they intend to use the site more, compared to 40% of Instagram users. Of course, Pinterest isn’t suitable for every business, but it is for many and continues to grow in popularity. Therefore, it makes sense that if you currently don’t use Pinterest to market your content, then it should be worked into your 2013 marketing plan. In addition to this, brands fare better on the pinning site as people tend to share more often. Engagement is more difficult to achieve than many people think as consumers tend to actively follow a few key brands. According to the study, this is because many companies are still failing to provide compelling content that their fans actually want to see. 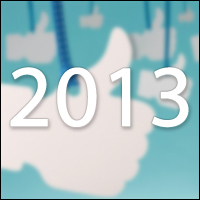 If your campaign has been weak in 2012, then it’s a good idea to have a good look at the analytics for your social media campaign for that year. Ask you fans what they want, conduct your own surveys and ensure that your plan for next year take this all into account. Come up with great content and your fan base will improve as you become a brand that is important to them. Don’t ignore SEO services and advertising: whilst there’s been debate over the value of Facebook advertising recently, it’s still seen as being worthwhile. However, this must be supported by researching keywords relevant to your company and incorporating them into your company description on social media sites, as well as using other advertising models such as Google and mobile. Work out your budget well in advance and ensure that it’s spread across a few channels. The below chart shows that people still trust their friends more than any other sources. It’s no real surprise to anyone that politicians scored the lowest, but the surprise element of this was that people are more likely to trust the brand itself than fans of the brand, unless of course they are already friends with that fan. However, brand users, people who actually and actively use a brand’s product are also seen to be influential. This means that having a strong content strategy in place whereby you vary content and give value is especially important to your 2013 campaign, as is interacting with the consumers of your product often and well. Perhaps the most surprising aspect of the study is that consumers want to be involved in the creation of the content that their favourite brands produce. 80% said that they would “love to be involved in co-creation projects of brands they like”; this means using tactics such as surveys, case studies and anything that can make the fan feel involved in the creative/production process. This could be carried out as a competition in which your ‘best’ fans can get the chance to have their say and influence the brand, making them feel special and leaving your other fans hankering for more. So the main message for 2013? Involve your fans in your brand, spread your content as widely as possible, ensure it’s extremely high quality and include SEO practices in the heart of your campaign. Need a new social media agency for 2013? Get in touch for a detailed proposal.